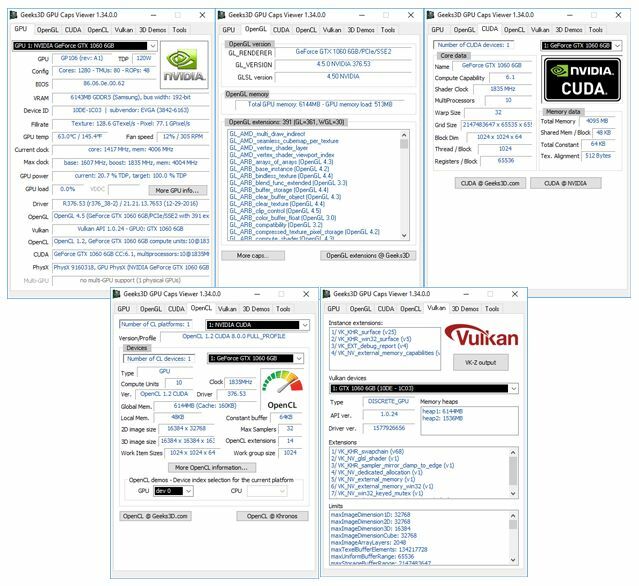 GPU Caps Viewer 1.34.0 adds the support of the latest GeForce GTX 1080 Ti, Radeon RX 580, RX 570 and RX 560 (based on Polaris 10/11 GPUs) as well as Radeon Pro WX 7100, WX 5100 and WX 4100. Command line parameters can be found in the _run_geexlab_benchmark.bat file available in GPU Caps Viewer folder. The benchmark results are saved in a CSV file (_gxl_benchmark_results.csv). Another change brought to GPU Caps concerns the UAC (User Account Control) execution level that has been reset to the default value (as invoker). The previous UAC level (administrator) didn’t work well with launching demos via the command line. All Vulkan code has been recompiled with latest Vulkan headers (v1.0.45). GPU Caps Viewer 1.34.4.0 is a maintenance release and comes with a better Vulkan support. The Vulkan field in the GPU tab is now updated according to the selected GPU. 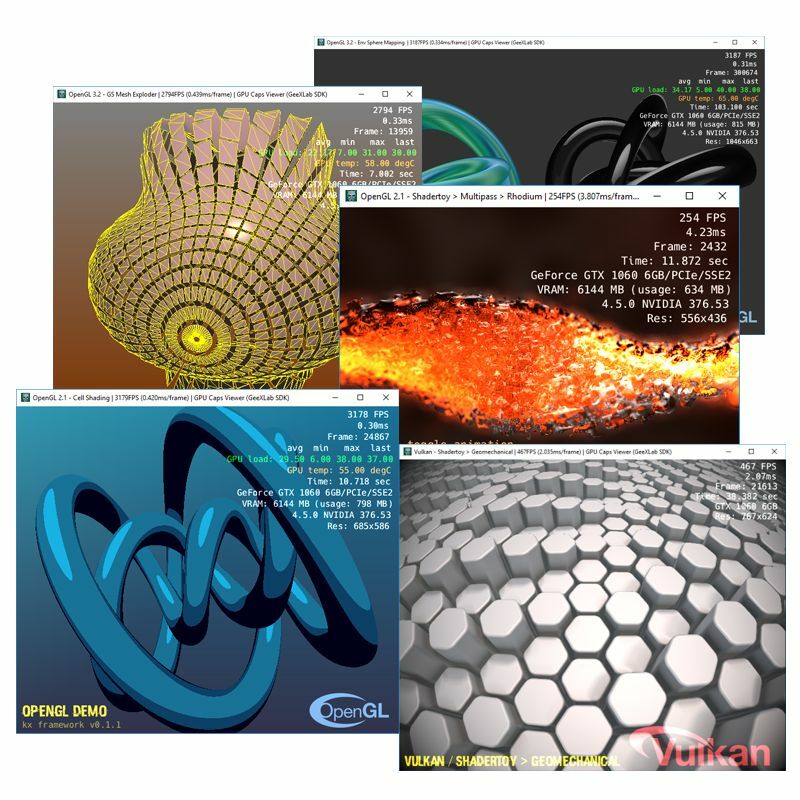 The Vulkan plugin of the GeeXLab SDK comes with an improved support of AMD and Intel GPUs and resizing of Vulkan demos has been fixed. GPU Caps Viewer 1.34.3.0 is a maintenance release and improves the detection of recent AMD Radeon GPUs (RX 580, RX 570, RX 480 and RX 470). GPU Shark has been updated to version 0.9.11.4. VK-Z has been updated to version 0.6.0.5 32-bit (it has been recompiled with other compilation options in order to avoid false positive detection with antivirus. I really don’t understand this pesky problem!). 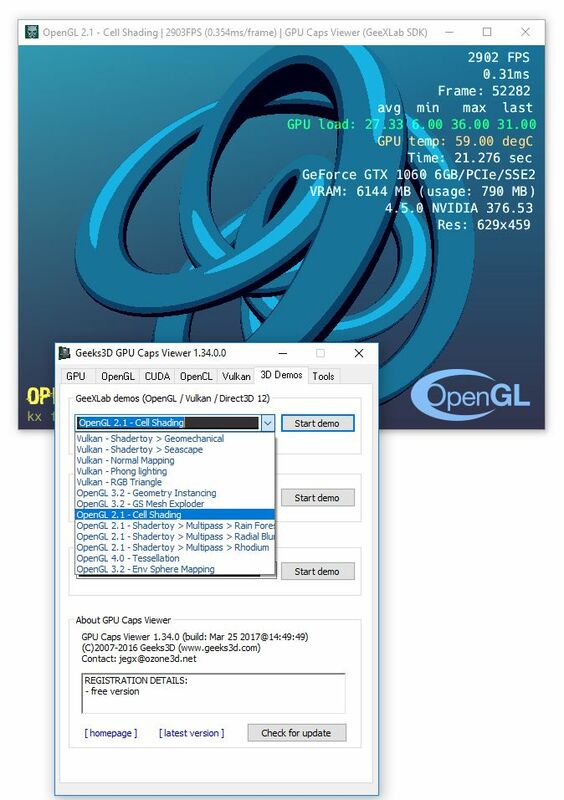 GPU Caps Viewer 1.34.2.1 is available with VK-Z 0.6.0.3. The previous 32-bit version of VK-Z was detected as infected by some antivirus scanners. Now VK-Z 32-bit is clean for Nod32, Avira, Avast, Kaspersky, AVG, Norton, and MacAfee. GPU Caps Viewer 1.34.2.0 adds the support of NVIDIA TITAN Xp. GPU Shark and VK-Z have been updated to their latest versions. GPU Caps Viewer 1.34.1.0 improves the detection of AMD Radeon GPUs in some systems that include Intel iGPU + AMD Radeon GPU. A new GeeXLab/OpenGL demo has been added (Alien Corridor).
! 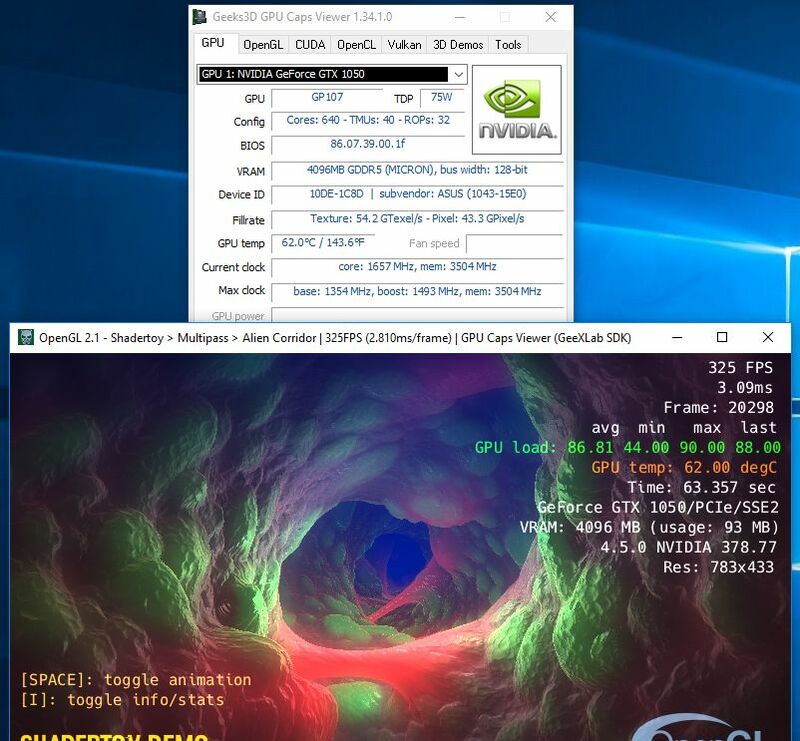 Vulkan field in GPU tab is now updated according to the selected GPU. * fixed a bug in the VK-Z output window (there was garbage at the end). * fixed minor bugs in the Lua kx framework (v1.4) used by GeeXLab demos. support of AMD and Intel GPUs.
! updated with GeeXLab SDK libs.
! replaced VK-Z 0.6.0.5 32-bit by VK-Z 0.6.0.3 64-bit. antivirus. VK-Z 64-bit is only executed on Windows 64-bit. RX 480 and RX 470.
! updated: ZoomGPU 1.20.4 (GPU monitoring library). + added support of NVIDIA TITAN Xp. that include Intel iGPU + AMD Radeon GPU. + added new OpenGL demo (GeeXLab): Alien Corridor (based on this demo).
! updated: ZoomGPU 1.20.2 (GPU monitoring library). + added new parameters for launching GeeXLab demos via the command line. + added new Vulkan and OpenGL demos (GeeXLab): Vulkan geomechanical (based on this demo), OpenGL rainforest (based on this demo), OpenGL radialblur (based on this demo), OpenGL rhodium (based on this demo), OpenGL cell shading, OpenGL geometry instancing, OpenGL gs mesh exploder.
! set UAC (User Account Control) execution level to as invoker.
! recompiled with latest Vulkan API headers (v1.0.45).
! updated: ZoomGPU 1.20.1 (GPU monitoring library). Hi JeGX, I downloaded the V1.34.0, it still didn’t show AMD Radeon Pro WX 7100, WX 4150 and WX 4130 on Win7, but Win10 is ok.
You can refer the link for compared screen captured pic. Or should I provide what the information to you? THX!! Could you post here or in the forum, the win7 log file of GPU Caps Viewer ? Open CL GPU 4D Quaterian Julia goes and then stops on second whit some black stripes. Virus Deteted on executable by Panda Antivirus. W32/Exploit. VK-Z output button opens a blank screen. vkz.exe is still flagged as virus by avast, as of version 1.34.2.1. It seems you didn’t actually fix that issue. Not strange, since AVG is owned by Avast now. It’s still being flagged by Norton as well. Norton is no longer flagging it with the latest version (1.34.3.0). Virus detected by Avast when running the latest version, 1.34.3.0 – Win32:Malware-gen. It prevents the application from running, sending the infected file to quarantine. Please fix. vkz.exe from v1.34.3 is still flagged by avast as of 28/4!!! I give up with all these false positive results. I replaced the 32-bit version of VK-Z by the 64-bit version in GPU Caps Viewer 1.34.3.1. Should be fixed now. Thanks, no more virus alert! Maybe you should contact avast about this issue. Btw, if you replaced the 32 bit version with the 64 bit version, then that means no 32 bit support for vk-z or what? Hello, I have a GTX 1070. Is it normal or why does one of the 3D Demos always seem hang when I try to change the window size and then stay black? The framecount is huge, it should be easily able to do a change like that unless the software forbids it (or there is some problem). In the Vulkan toy Geomechanical even the driver crashed when I tried to change the window size although the card generally runs stable with its settings, also in Furmark and Unigine (even parallelly). Could it be a simple driver issue? Neither the GPU load nor Power Consumption are maxed, though GPU-Z there is some Reliance Voltage cap active. It is probably related to framecount, similar as in Furmark where lowering MSAA raises frames and lowers MHz, but here it is actually a completely average load. It crashed again when touching the window in Geomechanical. I don’t know what you have against my completely serious and valid comments and question. Besides, I seriously think some of the demos are buggy. I can change Seascape and Geomechanical into fullscreen without problem, but I can’t adaptively change the window size without frames going exteremely low, the window turning black, and the demo usually craashing. Even with default GPU settings. And your 4D Quaternion Julia Set demo also was clearly buggy when I had an RX 480, But I suppose this is a really old demo, and I have had similar problems with a MSI Kombustor test like it (it just looks completely wrong). Maybe you should give a warning for the demos or do some more testing with them. Especially newer demos shouldn’t kill one’s graphics drivers (and even more drivers, never mind) when touching the window frame. Disagree? we found if we run capsviewer 1.34.3.1 through command_line , the opencl test will failed and capsviewer will carsh, but the new vulkan test all passed. we run the same opencl test from capsviewer GUI , all test passed. so we check the diffrerent of command-line and GUI. we found in the command-line mode, we use the paramater /bench_log_results to save log, and capsvirewer try to save the result to bench_result.csv but failed. Thanks for the feedback Jerry, I will fix the bug in the next release. Is there a way to select OpenCL platform through command line? In one of the example batches you have “/cl_device_index=0” but I see no way to select OpenCL platform. Caps Viewer crashes with phong lighting and normal mapping of the Vulkan 3D Demos on my GTX1080. Running latest drivers. If you mail me, I’ll provide any necessary logs. I found a bug in v1.34.4. I recently updated to a GT 1030 (GP108) and now GPU caps viewer shows both fillrates (pixel & texel) as 0.0. Weird, the GT 1030 should be supported by GPU Caps Viewer. Could you post a screenshot of the GPU panel? How do i attach a SS here???? 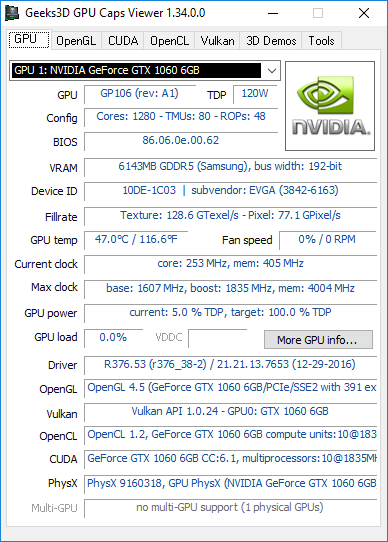 Ok I think GPU Caps 1.34.x.x does not support the GT 1030 (the GPU monitoring lib has not been properly updated). The new version 1.35 will fix it. I should release it today. Let me know if it works better for you.